Arachnid is a computer solitaire game originally written by Ian Heath in the early 1990's. 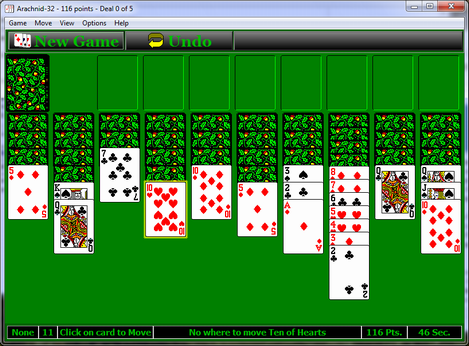 It is my favorite solitaire game and one of the most challenging solitaire games that I have every played. I've enjoy playing Arachnid so much that I have moved if from computer to computer, through various operating systems starting with Win 3.1 and continuing through Win 95, Win 98, Windows XP, Windows Vista, Windows 7 and Windows 8. 16-Bit Program. Since it was originally written for Win 3.1, Arachnid is a 16-bit program. Although it still works fine with all 32-bit versions of Windows, 16-bit programs will not work under 64-bit versions of Windows. Since more and more users are adopting 64-bit versions of Windows, there are fewer and fewer computers that will run Arachnid. In my own case, half of my computers are running 64-bit Windows, and I'm now suffering Arachnid withdrawal whenever I use one of those computers. Spider Solitaire. One alternative to Arachnid is the Spider Solitaire game that comes with most versions of Windows. It is a similar game, but it lacks certain features that make Arachnid particularly addicting. For example, Arachnid allows you to make moves with a single click, that speeds up the game and makes it possible to quickly explore different strategies and options. In Spider Solitaire, you have to drag the cards to their positions, which slows down the game and makes testing alternate strategies tedious. New Version. For all the above reasons, I decided to write a new version of Arachnids. This version is 32-bit so it will run under either 32 or 64-bit Windows. At the same time, I was able to add more advanced features to Arachnids that weren't commonly available back in the Windows 3.1 days.